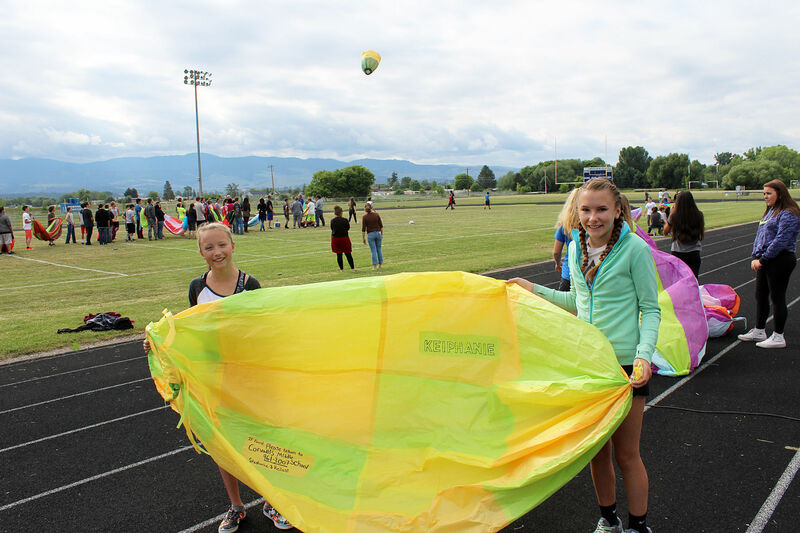 Corvallis seventh grade students Madelyn Shepherd and Amanda Boelman carry their balloon to the launch site at the CHS football field with the help from their teacher Jennifer Powell (center). Corvallis Middle School seventh grade students spent three days of designing, cutting and gluing to create a hot-air balloon from tissue paper. On Thursday morning, they tested the air-worthiness of their creations with a launch at the school’s football field and track. Educator Stacy Jessop said the annual event is a 20-year tradition. The 137 students were launching, chasing and repairing their balloons in groups of two and three. With the heat at 65 degrees and no breeze, most of the balloons did not fly farther than the field. The few that went further stuck in trees of homes in East Corvallis. Teacher Dave Bradshaw said students were creative. Corvallis Middle School science teacher Chris Maul-Smith said he looks forward to the balloon project. Maul-Smith said the balloons rise up to 200 feet and travel usually 200 to 300 yards, depending on the weather. The colder the day the higher the balloons fly. Maul-Smith and Dave Chimo filled the balloons and released them into the air. The balloon team of Amanda Boelman and Madelyn Shepherd said it was a fun project. “We learned about hot-air balloons and it was great,” Boelman said. Stephanie Weber and Alexa Sunderland said creating and launching their balloon was cool. Sunderland said, “It went farther than I thought but it would have been cool to go further and out of the field.” Ramsey Snider and Carter Humphrey repaired their balloon’s several holes after their first launch. This is Jennifer Powell’s first year to teach seventh grade. She was delighted to be included in this project that she has heard about for years.